If you are familiar with Halong tourism by means of aircraft, passenger car or motorbike, this time, try to travel by train. 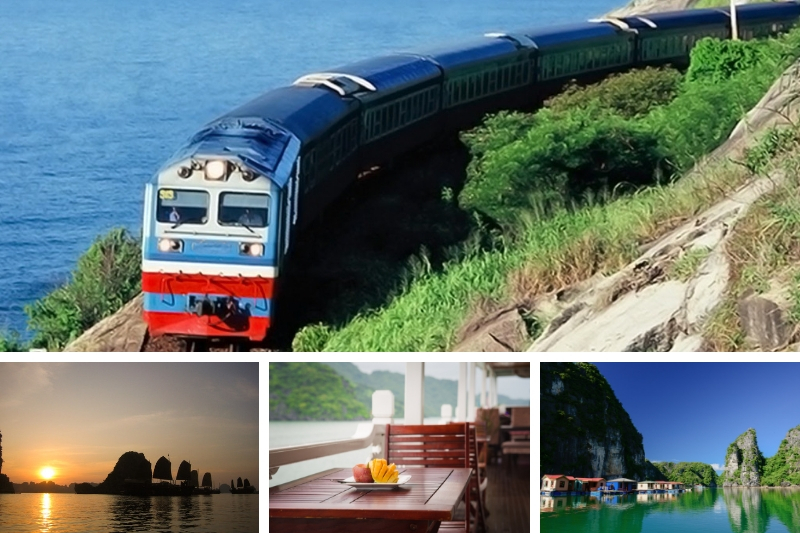 Travel Ha Long by train "promises" will bring visitors interesting experiences. The article below will help you useful information when coming to Ha Long by train. HaLong Express train departs from Gia Lam (Ha Noi) to Ha Long (Quang Ninh) to serve tourists from Ha Noi to Ha Long. The train consists of 6 coaches, each car has 62 soft chairs and a carriage service for passengers, including bar and trolley for catering. HaLong Express trains take less than 2 hours from Gia Lam to Ha Long and vice versa. Guests can refer to the schedule and fares below. If you take a helicopter from Hanoi - Ha Long, you will lose at least 350 USD / person / way (approximately 8 million). If traveling with high quality coaches, you lose about 180,000 VND / trip. But if you take the train, you only cost about 5USD (approximately 110,000 VND). This shows that travel by train is much cheaper than other means. Not to mention, you book as soon as possible, the fare is cheaper. In addition to the benefits of cost savings, cruise also help visitors comfort, sightseeing, relaxation. Buses are less traveled during the day and the doors are quite closed so travelers want to see the scenery is also difficult. In contrast, the train runs from early morning, the glass door wide and open, through the window of the train, visitors can watch the whole scene along the road. You will relax throughout the journey instead of sleeping time like on the plane, bus. You can find more Ha Long tour from Origin Vietnam. If you travel only 7kg luggage, when traveling by train, passengers can carry a maximum of 20kg. Enjoy your favorite items or gifts for relatives, friends without fear of being weighed, charged rigorous. In addition, each car will have a suitcase at the end of the car, you can comfortably use. Luggage on board by self-preservation. So everyone must be active in this, avoid the case of fraudulent trifling or theft. Take a train for a long time so visitors have time to chat, more new friends. The seats on the train often turn together so visitors easily ask questions, chat with the opposite person. Guests can also chat with the person next to or behind if they have inspiration. Many young people on the train also bring guitar, the song on the train, creating a fun atmosphere. And, if you meet a funny friend, you will have fun on the train. For those who are frequently involved in motion sickness, they should take part in these conversations, to forget about the motion sickness. Compared to Travel Halong by motorbike, Ha Long tourism by train is not as interesting. But in return, visitors relaxed back when tired. There are many types of seats available for guests to choose from such as hard chairs, air-conditioned chairs, beds ... Each type has a different disadvantage, visitors can choose according to their preferences and needs. Traveling by train is not as well served as on the plane but in return, visitors have impressive experiences. Traveling by train requires a lot of travel, so travelers should carry lightweight luggage for easy transport. Important things, visitors should put in a small bag to take out use when necessary. You should wear simple, comfortable dress. Because of the inconvenience, it is best to bring your trousers, t-shirts and flip flops. Do not forget to bring your jacket, hat, sun shine into the cabin. If traveling a long way, then visitors should bring more blankets / blankets to lie down comfortably on the train. Please bring personal items such as towels, brushes, toothpaste, mirrors, combs, some simple cosmetics ... In addition, you should bring 1-2 books, newspapers or magazines. That the best way to kill the time while on train. If you intend to travel by train, visitors should carefully understand the fare and departure time of the train. Train ticket, you can book online on the website: https://dsvn.vn or directly at the station. To buy train tickets from Hanoi to Ha Long you can go to Gia Lam station at Ngoc Thuy ward, Long Bien district, Hanoi. Before you go to the station, you should go to the website to find the price and find the right seat, grade, paper on a sheet of paper or notebook. When you arrive at the station, you only need to give the information you need to the ticket seller. You should buy tickets as soon as possible. Buying tickets early will not only help you buy tickets, but also avoid tickets. In addition, if you travel in large groups, the purchase of tickets early will help people sit together or a common carriage. Most of the ships have canteens for visitors to eat. However, the food on board sometimes does not match the taste of many people. Especially, the canteen is always crowded, waiting to buy food is very inconvenient. You should prepare some simple foods like instant noodles, eggs, sausages, sandwiches and so on. Ships usually stop at major stations and then there are loads of vendors asking for purchases. At this time, you can buy more food to reserve for the next trip. There is plenty of water available on board, but it is very inconvenient for you to go back and forth to pour water. Have 1 to 2 1.5-liter water bottles and some plastic cups. If the group is large, visitors should assign each person to hand. The above information is necessary for visitors to consult when they intend to travel Halong by train. Please remember to write in the travel guide Ha Long to get used when necessary. By this, Origin Vietnam Travel would like to wish you a happy trip and filled with joy.